When Dola Mukherjee, 26, sang Tagore's 'Phule phule dhole dhole bohe ki baa mridu bai' (Flowers nodding their heads in the gentle spring breeze) in her mellifluous voice, her prospective in-laws were totally bowled over. However, members from her own family were aghast. "They wanted me to sing a more complicated Rabindra sangeet to impress the boy's family as I have a degree in music from Rabindra Bharati University (RBU). Families in Bengal take great pride in the ability of their children to render the songs written and composed to music by Gurudev Rabindranath Tagore," explains Mukherjee with a smile. Adds Srabani Sen, an eminent Rabindra sangeet singer and a teacher at RBU, "There is no doubt that Tagore songs are ingrained in every Bengali. Children are brought up on Rabindra sangeet. Everyone can sing a few lines from Tagore, even many non-Bengalis." But she goes on to make an interesting observation, "It's true that a girl's ability to render Tagore songs holds great sway in marriage negotiations but, often enough, these same girls are not encouraged to continue with their singing after marriage. The careers of many of my students, brilliant singers, have been ended prematurely because of this." As the country celebrates the 150th birth anniversary year of Nobel Laureate Rabindranath Tagore, there is a renewed interested in the songs he composed which come under the genre of 'Rabindra sangeet'. And among its greatest exponents are eminent women singers from both in West Bengal and Bangladesh. From the late Kanika Bandopadhyay and the doyen of Rabindra sangeet, the ailing Suchitra Mitra, to the veteran Purabi Mukherjee and the darlings of GenNext, Srabani Sen and Lopamudra Mitra, Bengal has many famous women singers. Artistes like Debarati Som, Swapna Ghosal and Pramita Mullick are also on the long list of women who have brought to life Tagore's magnificent repertoire with their golden voices. Even in Bangladesh, the likes of Rezwana Chowdhury Bannya, Rokaiya Hasina, Papia Sarwar and Shumona Haque have done justice to preserving the songs of the great poet. If making a career in music is tough, making one in Rabindra sangeet is tougher. Male singers invariably give up any inclination to follow this career path when they have to take on the responsibility of a family. Women, however, seem to have done better. Says Sen, "My mother, Sumitra Sen, is a renowned singer as is my elder sister, Indrani Sen. I was brought up amidst Tagore's songs and turned to singing them after working as a journalist for seven years. The evocative lyrics and the haunting melodies are simply irresistible." Sen points out that Tagore has helped bring social recognition to many. "My mother sang on AIR and Doordarshan and she taught at the RBU. Her earnings went a long way in providing little luxuries for my sister and myself. She helped my father financially too. Today, with my own singing career, I can afford a luxury car and travel abroad on a regular basis. For many artistes in Bengal, Tagore is a means to earn their bread." 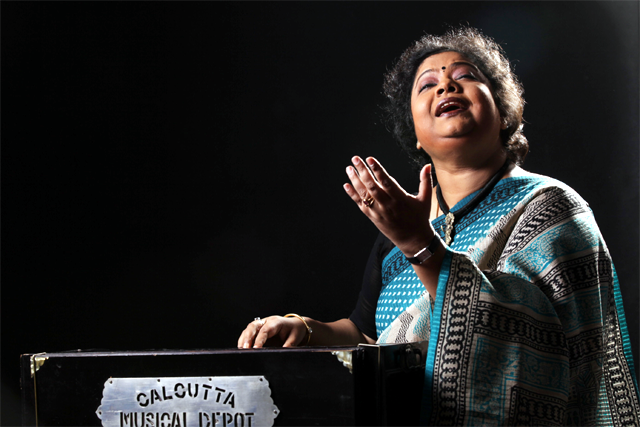 There are fears among many aficionados that Rabindra sangeet's fan following is on the wane. But younger singers like Sen and Lopamudra Mitra know just the way to attract the GenNext. "In the age of pop-bands and international audiences, the languid melody of a typical Rabindra sangeet rendition does not attract the younger generation or the masses, unless one experiments with the genre," says Mitra. But both Mitra and Sen agree that the 'bol' (words), 'taal' (beat), 'sur' (melody) and 'swarolipi' (notations) of Tagore's songs should remain untouched in any exercise of experimentation. Improvisation comes in the orchestration and presentation, change in introduction of interlude and prelude and in the use of new instruments like the German flute called the 'chalumeau', the middle eastern 'oud' and 'saz', the keyboard, guitar and even folk instruments like 'ganjira' and 'ektara'. There is no doubt that young people enjoy Mitra and Sen's albums but there is a large section of music lovers like Siben Ghosh, 60, who swear by pure Rabindra sangeet without ornamentation. "My generation counts Suchitra Mitra as the leading exponent today. She sings strictly to Tagore's composition with only the 'tanpura' or 'esraj' as accompaniment. The melody of the lines is played between renderings of the lyrics as Tagore intended. That is the purest and most likeable form," says Ghosh. But according to singer Swagatalakshmi Dasgupta, Gurudev himself was open to several forms of music. The 'Gitabitan' (garden of songs) - as the collection of over 2,200 Tagore songs is called - has several songs set to tunes of Scottish ballads, Irish folk and European classical, South Indian Carnatic music and the music of the Bauls (wandering minstrels). Dasgupta's albums 'Sagar Parer Hawai', 'Pravasi Pakhi' and 'Swadesh Bidesh' bring together the songs Tagore composed under western influence. While Tagore's 'Purano Shei Deener Kotha' (The words of bygone days) is set to the famous Scottish 'Auld Lang Syne', 'The Vicar of Bray' is recognisable in 'O Dekhbi Re Bhai' (O brother, you will see). 'Tui Eye Ray Kaache Dhole' (You come close swaying) is set to the famous 'The British Grenadiers'. "These albums found a huge international audience for Tagore songs. I had sung the original western songs too in my albums and as music has no language the western-inspired tunes composed by Tagore for Bengali lyrics found immense acceptance and appreciation," says Dasgupta. It's this aspect of Tagore's work that encourages the younger singers to experiment. "The poet himself was a great experimenter, so why can't we try to enrich Rabindra sangeet in our own way?" asks Sen. But she adds whimsically, "My mother, however, believes Tagore is best when left untouched and I love to hear her sing." It is this ambivalence that has left the women singers more loyal to pure Tagore than some of their male counterparts. After the copyright on Tagore's work expired in 2002, a few male singers took great liberties with the originals, changing the composition and even the lyrics in some cases with disastrous results. Another reason why more women singers are drawn to Tagore is because they identify with the depth of emotion in his lyrics. The repertoire is divided into sections - 'Puja' (Worship), 'Prem' (Love), 'Prakriti' (Nature), 'Bichitra' (Diverse - songs written on different non-specific themes), 'Swadesh' (Homeland) and 'Anushtanik' (Occasional). While Mitra confesses equal affection for the love and worship songs, Sen prefers those categorised as 'Prem'. "Suchitra Mitra's 'Puja' and 'Swadesh' song renderings are all-time favourites with listeners, as are her melodious presentations from 'Prakriti' - songs written by Tagore for all the six seasons," says Ghosh. "Tagore songs are lyric-based, capturing the listener's softer side. The line between different sections is thin. A song from 'Prem' can easily be for 'Puja', one from 'Prakriti' about rains can also be a love song ('Prem')," says Sen, who lists 'Aaj godhuli logone' (Today at this hour of twilight), from 'Prem', as her particular favourite. Tagore has also written several dance-dramas. Here, too, he has shown amazing versatility. Says Sen, "While all the songs in 'Maayar Khela' (Play of Illusions) can be sung separately, the compositions in 'Valmiki Pratibha' or 'Shyama' don't fare well as standalone music." The appeal of Rabindra sangeet is universal, the language barrier notwithstanding. Within India, singers from Lata Mangeshkar and Asha Bhonsle to Kavita Krishnamurthy, have tried their hand at them. Next time a Bengali claims that Tagore has something to say for every season, every mood, every emotion, every occasion, please believe them. The Bard truly did leave behind an amazingly large repertoire of songs!